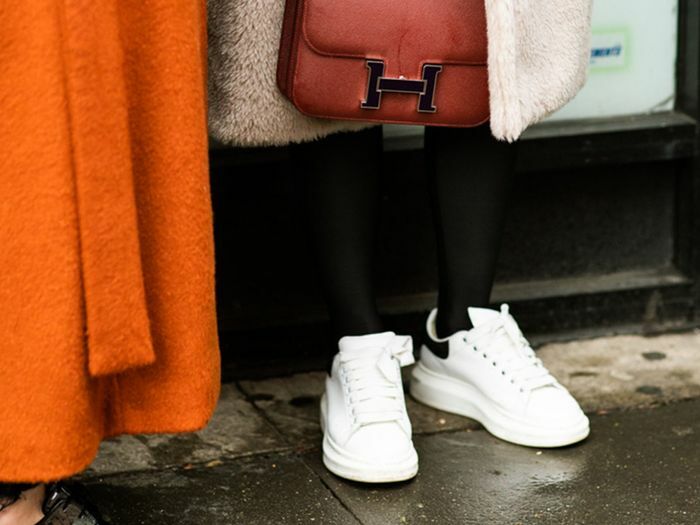 It's beyond clear at this point that fashion girls are obsessed with white sneakers. But one infrequently discussed aspect of these trendy wardrobe staples is just how to clean white sneakers and keep them so fresh. After all, one quick trip to the coffee shop could result in a number of mud-, dirt-, or oil-centric disasters. Yet celebrities, bloggers, fashion editors, and everyone in between always seem to sport only the whitest of white sneaks. How do they clean their white shoes to keep them in such pristine condition? We did a bit of digging to come up with some super-helpful tricks to keep those babies sparkling long after you've made the initial purchase. While some of these hacks are straightforward, like cleaning the white laces in warm water, some of the other tips you'll find here genuinely surprised us, too. How to (really) clean your white sneakers is no longer a mystery. It's as simple as that. If you see a little scratch or smudge on your spankin'-new white sneaks, just take out your favorite white nail polish and do a little touch-up. It works wonders. There are a ton of handy little cleaning tools out there to help with this. We prefer Mr. Clean wipes and Magic Erasers, but if you don't have anything like that on hand, take a washrag and dip it in vinegar from your pantry. Rub gently to remove small stains. Voilà! Use an old toothbrush, warm water, and gentle soap if your shoes have some dirt spots in hard-to-reach places. Scrub gently! You might be tempted to just toss your white laces in the washing machine—tsk-tsk! Instead, hand-wash them in warm water with gentle soap and let them air-dry. Your shoes might be a bit damp after you're done cleaning them; to help them dry faster, put crumpled-up paper towels inside the shoes. They'll absorb excess moisture and help the shoes dry more rapidly. Let's say you stepped in an oil slick crossing the street, or perhaps you dropped a big greasy french fry on your new sneakers (it happens to the best of us). When you get home, use your gentlest shampoo, warm water, and a toothbrush or rag to gently wipe at the oil smudge. It should come right out! Don't leave your white sneakers outside! They're already getting enough UV exposure as it is, which can lead to fading and unwanted discoloration. Treat them well and store them in a cool, dark place when they're not being worn. To the crux of the issue: Can you use bleach on white sneakers? Yes, you can, but you have to dilute it. Most shoe-care guides suggest mixing one part bleach to five parts water; any more than that and you risk turning your white fabrics a weird yellow tone. Dip your toothbrush in the diluted bleach solution and scrub the shoes gently. Rinse with warm water when you're finished. With these hacks in your back pocket, go forth fearlessly in your white sneakers. Because now you'll always know how to keep them in mint condition.